Thank you for taking the time to get to know us and allowing us to get to know you better. 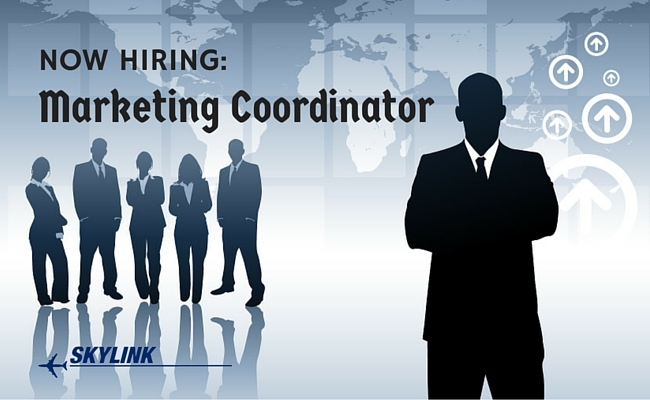 We're looking for the next person who will be a perfect fit to the Skylink team. Is it you? If you think so, read the open role below and let's get together. We're a dedicated team working together to bring efficient supply chain solutions to international airlines, MROs and military aircraft fleets. We deliver this by following our "Never Forget Your Wings" mantra. Every day we help fleets remain in the air and avoid the complexities of aircraft maintenance. Skylink started its humble beginnings in 1988 from a defunct airline where founder Jim Anglin was an executive. He started by providing rotable sales to anybody that needed them. Today we’ve molded into a supply chain powerhouse. We're thrilled to work with dedicated airlines, MROs and military clients in over 30 countries. They look to us to streamline their supply so they can worry less about fleet maintenance and reduce the complexities felt by so many aircraft maintenance and purchasing professionals. You'll work at our Skylink hub in Sanford, FL. You'll have your own workspace and organize it with what makes you happy and inspires you. You will work daily with various Skylink teams, clients, and supply chain partners that span every country on this fine planet we call home. Here at Skylink we have no central management and no hierarchy. We have dedicated teams with specific roles and coaches to guide the knowledge base. Teams are able to make their own decisions as long as they involve people affected in the decision and people who have knowledge in the decision topic. We are constantly innovating and everyone's ideas matter. Flexibility and improving is our middle name. We all work to maximize the value we create for customers and to create "WOW" experiences every step of the way. We're looking for an Account Manager who will take charge of customer accounts and focus on developing new accounts. Our dedicated Account Managers work closely with customers to create "WOW" experiences at every touch point whether it be phone, email or any other medium. You'll work closely with customer happiness engineers, content creators, account manager copilots, and supply chain champions to provide efficient supply chain solutions for customers and potential customers. In order to provide proactive solutions you'll need to learn the solutions we provide and how to strategically quote client projects to make a positive impact on their operation. You’ll also have to be comfortable contacting people and providing value based solutions around their specific pains. Sales experience isn’t necessary but a relational approach is. Being organized is essential and having a cross-cultural mentality is a must as we work with many people from all over the world. We develop relationships first and accounts second. Even in stressful times you’ll need to keep calm and focus on creating the “WOW.” You'll be tested to think outside of the box and avoid industry norms. We strive for a balance of being a team that feels like a family. This means we share feedback regularly, support each other's self-improvement efforts, and take mistakes as opportunities to learn together. Using your mind to innovate is highly regarded. If you can build deep relationships with customers and aren't afraid to contact potential prospects to resolve their pains you'll be a perfect person for this role. We are deeply passionate about working as a team and going over and beyond for our customers. Creating "WOW" experiences, be willing to adapt and drive change, hustling and driving maximum efficiency, accepting problems and solving them, building a team-oriented approach, and having passion and integrity are the core values we live by. If you feel you embody each one of these then you'll be an AMAZING addition to our team. Technology: You'll get hooked up with technology that'll make your life easier so you can do your best work. Salary: Base salary + tiered commission for account managers. We've created a salary formula that takes experience and seniority into account and changes based on this formula. Health insurance: You'll have the option to take on our health insurance and every year we'll take on a higher percentage of the payment. Work-space: You'll have your own work-space so you feel like a champion. Celebrate life: Every month we celebrate the birthday's and get together over lunch. Healthy living: We strive for a healthy mind and body. Nate Anglin has focused 10 years of his life to bringing this concept to the business world. He'll help you navigate this often confusing topic for your life if you need guidance. Still reading? We want to hear from you! We’re a dedicated team working together to bring efficient supply chain solutions to international airlines, MROs and military aircraft fleets. We deliver this by following our “Never Forget Your Wings” mantra. Every day we help fleets remain in the air and avoid the complexities of aircraft maintenance. Skylink started its humble beginnings in 1988 from a defunct airline where founder Jim Anglin was an executive. He started by providing rotable sales to anybody that needed them. Today we’ve molded into a supply chain powerhouse. We’re thrilled to work with dedicated airlines, MROs and military clients in over 30 countries. They look to us to streamline their supply so they can worry less about fleet maintenance and reduce the complexities felt by so many aircraft maintenance and purchasing professionals. You’ll work at our Skylink hub in Sanford, FL. You’ll have your own workspace and organize it with what makes you happy and inspires you. You will work daily with various Skylink teams, clients, and supply chain partners that span every country on this fine planet we call home. Here at Skylink we have no central management and no hierarchy. We have dedicated teams with specific roles and coaches to guide the knowledge base. Teams are able to make their own decisions as long as they involve people affected in the decision and people who have knowledge in the decision topic. We are constantly innovating and everyone’s ideas matter. Flexibility and improving is our middle name. We all work to maximize the value we create for customers and to create “WOW” experiences every step of the way. We’re looking for an addition to our Sales Support team. In this role being organized with fantastic communication skills is crucial. Your day to day will be to help the Account Management team to create “WOW” experiences of your customers. Organizing RFQ projects and talking with suppliers is the foundational tasks you’ll be involved in. Paying attention to details (you’ll be entering data into our ERP system) being able to think outside of the box are winning traits for our sales support team. As an individual we invite you to be creative and innovate. We look for people that have this unique characteristic to join our team and you very well may be that person. If you’re not afraid to communicate, your smart, organized and can communicate well with your team, you’ll be a perfect fit. We are deeply passionate about working as a team and going over and beyond for our customers. Creating “WOW” experiences, be willing to adapt and drive change, hustling and driving maximum efficiency, accepting problems and solving them, building a team-oriented approach, and having passion and integrity are the core values we live by. If you feel you embody each one of these then you’ll be an AMAZING addition to our team. Salary: Base salary. We’ve created a salary formula that takes experience and seniority into account and changes based on this formula. Here at Skylink we have no central management breathing down your neck. We have dedicated teams with specific roles and coaches to guide the knowledge base. Teams are able to make their own decisions as long as they involve people affected in the decision and people who have knowledge in the decision topic. We are constantly innovating and everyone’s ideas matter. Flexibility and improving is our middle name. We all work to maximize the value we create for customers and to create “WOW” experiences every step of the way. We’re looking for someone to join our team who gets the importance of design, who can speak value propositions and who isn’t afraid to try new things. Our branding is important and with every touch here at Skylink and #NeverForgetYourWings we must speak the same language and give the same feel no matter who we’re speaking to. It’s how we create “wow” experiences. The market ing coordinator will have an in-depth relationship with content, email and social media marketing. Being well versed in each one of these is critical. You’ll start new projects, lead campaigns and see them through. It’s the build, test, and learn way. You’ll also need to know how to bring prospects into the funnel using inbound and outbound activities. If you have a knack for design, like to communicate, and like taking on projects, you’ll be a perfect fit to the Skylink team. We’re a dedicated team working together to bring efficient supply chain solutions to international airlines , MROs and military aircraft fleets. We deliver this by following our “Never Forget Your Wings” mantra. Every day we help fleets remain in the air and avoid the complexities of aircraft maintenance. How we do things happen at Skylink? As the Warehouse champion you’ll be responsible for receiving material from our suppliers as well as shipping material to our customers. You’ll also be responsible for organizing our warehouse shelves to ensure proper stock reporting. As a warehouse champion, what you do is the first thing our customer sees when our shipment arrives. Being methodical, paying attention to detail, and noticing problems and fixing them is huge. You’re the first touch and last touch for millions of dollars worth of product every week. Being in this role involves being a supply chain champion.